Throughout the year, The Moody Church hosts a variety of sports leagues and tournaments to help build community and fellowship. Whether you’re a natural athlete, a weekend warrior, or just play for the fun of it, we have something for you — so join us, and build relationships while having fun! Registration is now open for the Moody Church Softball League for the 2019 season. CLICK TO REGISTER. Invite a non-church person who has never played Moody Softball before and you and your friend will each receive a $25 discount on registration fees. Registration closes on May 15. Payment is required at registration. In addition to the traditional Saturday off for Independence Day, the league will have multiple “Free Saturdays” during the season, which will be Saturdays with no games in order to accommodate players who would like to have an open Saturday here or there for personal reasons. To maintain the ten-game regular season while having “Free Saturdays”, several game days will feature double-headers. 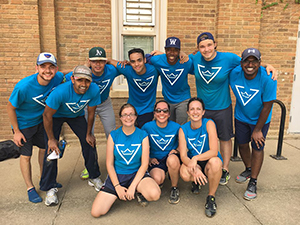 Moody Softball is a co-ed 12″ softball league that plays games from June through August, with playoff games in the last two weekends of August. Games, which are played Saturday mornings, are primarily social and secondarily competitive. Games are played at Clarendon Park on the northeast side of Chicago. Teams will be formed with a hybrid draft. Managers will be able to choose four other players to make up their initial 5-man roster. All other players will be then picked via draft by the managers. If you are part of another church that is playing in the Moody Softball League, you will be placed with your church. If your church has 2 teams, then your church teams will also be formed by hybrid draft.